Minnesota Whitecaps, welcome to the National Women’s Hockey League! After three exhilarating seasons in which three different Isobel Cup champions were named, the league finally has a new team in addition to the “Founding Four”. And while NWHL proponents knew that increasing the number of hockey clubs was always inevitable, it makes the introduction no less exciting. We had been waiting with bated breath for a new team to arrive, and that team is now here. We use the word “new” rather loosely. Even though NWHL League Founder and Commissioner Dani Rylan officially welcomed them as an expansion team to the league on May 15, 2018, the Whitecaps were already is existence as an independent women’s professional hockey team for years prior. 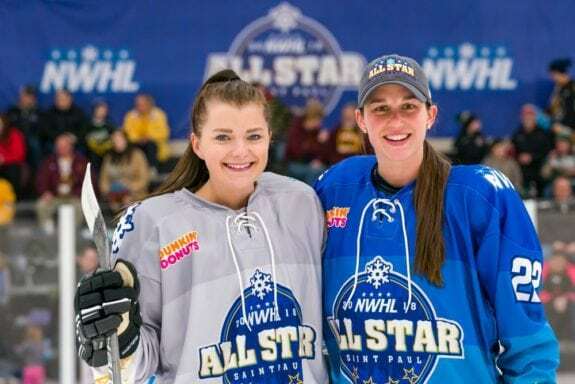 Based out of the Minneapolis-St. Paul area, the team was initially established in 2004 – well before the NWHL was even a glimmer in anyone’s eye. But with Rylan’s acute sense of pinpointing markets for the league, you knew that Minnesota was a locale she long wanted to be within. NWHL Founder and Commissioner Dani Rylan welcomed the Minnesota Whitecaps into the league on Tuesday May 15, 2018. Rylan was spot-on with her assessment of the rich hockey history housed within Minnesota, and did not need to be a seer in order to recognize the importance of garnering this particular market. What she has done however, was add the team to the league at just the right time. That certainly took a sense of foreknowledge and ingenuity. It will be interesting to see how the NWHL Free Agency period – which commences June 1st – impacts what players make Minnesota’s 2018-19 inaugural NWHL squad, and how many of the current Whitecaps are kept on the team. NWHL rosters are allowed a maximum of 25 players. A look at Minnesota’s 2017-18 roster listed a total of 38 players. Obviously some whittling down will need to be done. More than that though, Minnesota is bound to become a destination for numerous current NWHL players who have not been previously associated with the Whitecaps team. Buffalo Beauts captain Corinne Buie is originally from Edina, Minnesota. 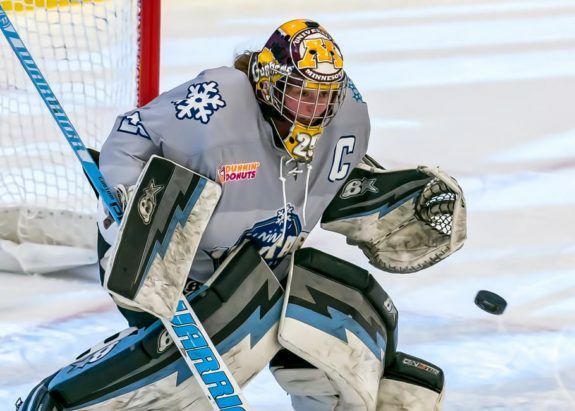 Arguably the best goaltender in the NWHL today, Amanda Leveille was in attendance at the Whitecaps press conference and won three NCAA championships at the University of Minnesota. Olympic gold medalist and Boston Pride skater Gigi Marvin hails from the legendary hockey town of Warroad, Minnesota. Beauts defender and former Olympian Lisa Chesson spent time with the Whitecaps previously too. Point being, there is a plethora of current or recent NWHL players who have ties to the State of Minnesota. Some – maybe even a majority of them – would find it quite lucrative to set up shop with the newest team in the league. Minnesota is an ideal destination, and the Whitecaps would be an ideal team to play for. These are exciting times for the NWHL and women’s hockey in general. But they are also exciting for the players themselves. Slowly but surely, more opportunities are presenting themselves in the league, and the summer is still very, very young. Roster Spots, but Are There Enough? One of the best parts of expansion in sports is that it opens up jobs – roster spots – for players who might otherwise be on the outside looking in. The more teams in the NWHL, the more opportunity for women to have professional hockey careers after completing college. Truly, it is a wonderful thing to behold. Right now though, especially with what we know about the Whitecaps already having players established within their program and within their community – ones likely to immediately be retained – it means that these newly added roster spots are somewhat limited. That is especially the case if previous Riveters, Beauts, Whale and Pride are to head to the “Land of 10,000 Lakes”. Still – and here is the most important component – no matter how you look at it, there are now 125 available NWHL roster spots instead of 100. 125 women will be fortunate enough to play professional hockey in this league. That number can only go up from here. The league is ascending at the right time, and a lot of ground can be gained while going up hill if you do it right. We are thrilled to have you here, Whitecaps. Welcome to the league, and let us #GrowTheGame together and in abundance.